Thailand and Cambodia will designate 64 villages along their mutual border as drug-free zones in an attempt to curtail cross-border drug trafficking. 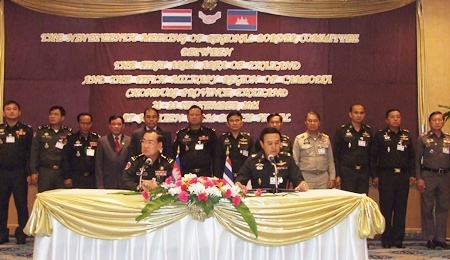 Royal Thai Army Col. Udomek Seetabut and Cambodian 5th Sector commander, Lt. Gen. Bun Seng announced the anti-drug plan at the 19th General Border Committee meeting Sept. 21-23 in Jomtien. 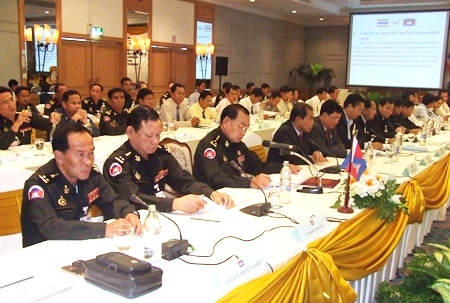 The semi-annual meeting also saw an agreement to expand Thailand’s royally sponsored “To Be No. 1” program to Cambodia and an affirmation of efforts to bring cross-border trade into compliance with the ASEAN Free Trade Agreement and crack down on shady tour operators. 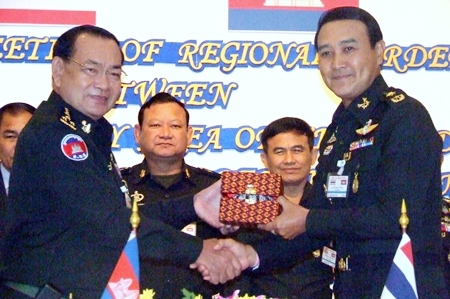 Royal Thai Army Col. Udomek Seetabut and Cambodian 5th Sector commander, Lt. Gen. Bun Seng, jointly sign a memorandum between Thailand and Cambodia. The meeting continued both sides’ recent focus on curbing drug and smuggling across the border. The latest plan to focus on cleaning up border-area villages is the boldest move yet. Both sides said they plan to create “white villages” that are drug-free and focus on increasing employment and education to discourage drug use. Both sides would also establish To Be No. 1 “friends corners” in villages to create a network among border-zone youths and offer activities that offer an alternative to drug use. The To Be No. 1 organization was established by HRH Princess Ubolratana and stages dance contests, music competitions and other activities around Thailand to keep kids off drugs. Udomek and Bun said the two sides will also continue promoting the benefits of trade under AFTA in preparation for establishment of the ASEAN trade bloc in 2015. Customs agents will begin subjecting agricultural products to AFTA’s certification and inspection of origin requirements. Finally, Thai and Cambodian officials promised to toughen inspection of tour operators and unlicensed tour guides to prevent fraud and exploitation of tourists.